"My sons died fighting different battles. Depression, Post Traumatic Stress Disorder and Traumatic Brain Injury are all just as deadly as heart disease, cancer or diabetes if left untreated. The military has trained medical professionals that can diagnose and treat these illnesses with hope of complete recovery. It truly is a sign of strength not weakness to let someone know you or someone you love is not ok. It takes courage to reach out for help." After the broadcast General Graham addresses soldiers directly. This message is far more valuable than the broadcast! The chairman of the joint chiefs of staff, Admiral Mike Mullen, warned recently that the number of military suicides will likely increase as large numbers of troops return home after multiple deployments. Mullen’s warning comes on the heels of a Pentagon task force report that found the military’s suicide prevention efforts, even after they’ve been beefed up, are still inadequate. 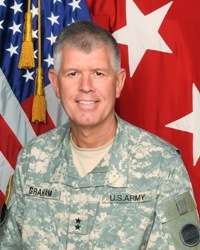 We speak to Army Major General Mark Graham, a leading figure in that prevention effort. 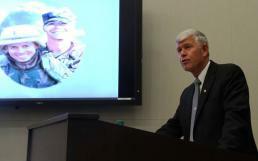 Gen. Graham lost both of his soldier sons, one in combat and the other, a promising ROTC cadet, to suicide in 2003. For information about Suicide Prevention Month or to request a suicide prevention presentation, or to seek assistance for someone contemplating suicide, call the Employee Assistance Program at 842-0895 or 843-9897.